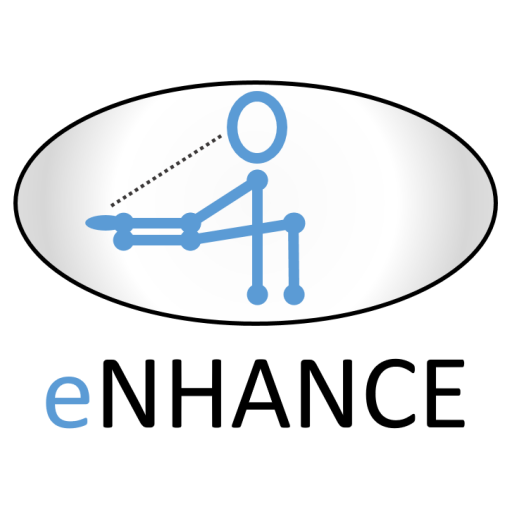 The overall objective of the eNHANCE project is to develop, demonstrate and initiate exploitation of new concepts to enhance and train upper extremity motor function during daily-life in people with physical disabilities. The eNHANCE support enables the users to achieve their desired movement actions, while motivating the users to maximise their contribution. This will maximise the user performance relative to his or her personal capacity, and thus maximise the therapeutic effect. Maximising user performance requires a personalised and motivating support taking into account personal behaviour in response to arm and hand support characteristics and motivational inputs provided by the system, taking into account environment, context and social interaction. Personal behaviour will be represented by a personalised behaviour model that is adaptively identified based on the discrepancy between the performance that is actually observed and the one predicted by the model. 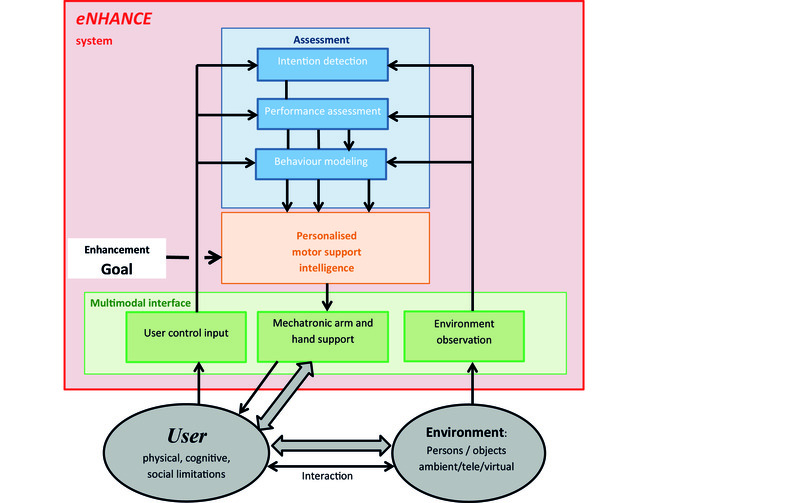 The eNHANCE concept for enhancing and training upper extremity motor function in people with physical disabilities during daily-life is graphically represented in figure 1.
an environment observation interface to create context-awareness. optimizing this support and supplementary motivational communication based on the performance prediction by the user behavioural model. stimulate and enable social interaction, supporting joint activity with other people. supplementary persistent random excitation of user support and motivational communication to improve adaptive identification of the user behaviour model. The key eNHANCE concepts and approaches for multimodal interface, user assessment and personalised support and therapy intelligence will be described in more detail in the following sections.